This is the begnning of Nedra. For those that did not use Nedra in EQ, It is pure based on a support class Character. Everything is extremely compressed for max viewing. The group window in the main focus. Fixed everything i could find wrong. Version 2.0 0 "starting over"
Working on rebulding the UI due to massive SOE changes. I have included Jaxel's quest window. I will be working with Laffs to get this thing going ASAP. 1st attempt to get back in the ball game. Need feedback on all problems and changes needed. Remove all reminence of the old Map UI...caused the missing arrow on map. Hopefuly fixed mail for the last time. I made no changes to the Journal window. I saw no feature add to the SOE UI and have yet to see any issues with my UI. If you see something, let me know. Changes to Add new UI features. Continued frame updating and compression. Made Tradeskill Spell Icon bigger. Added hp% and Power% to player in Group Window. Added the "unoffical Maps" map..... I will build in a new window for it every time a new offical release is out. Continued changes to compression and borders for most high use windows. Added "enter function" to broker window. Moved Player window into the group window. (No need for player window)I believe Alt-I will turn it off. Guessing this doesn't work now after TSO, am I right ? I have fixed the "enter" on the crafting window. Just have not posted it yet. I'll do that tonight. It's great to have you back and working on the UI again! One problem I've found is that the repeat button is missing in the crafting window as of version 2.02. Also, if you're taking requests, it would be fantastic if you could make it so that just hitting the enter key would work for both repeating a recipe and then starting a recipe. Thank you for your work on this UI! Great UI, I have one small request =P ... anyway you can add in the vitality % for adventurer and crafting ? that's the only thing I miss from my old UI lol. Last edited by Toede : 11-13-2005 at 05:23 AM. I just DL your latest UI, but have to head off to bed. I will load/play with it tomorrow. Its good to see you back even if Laffs did do a great job of keeping me from going into complete withdrawls. Last edited by sailgon : 11-08-2005 at 11:23 AM. I'm back and have been working on the UI. I hope to enlist Laffs to help me get the UI back online ASAP. Also, I will need tons of feedback from you folks to get the UI the way you want it. This mod no longer works with the current game patch. Will there be another update? Last edited by Minamas : 06-17-2005 at 09:10 AM. Re: A new version in the works? I certainly hope it is still being supported and that a new version is in the works. I loved his mod and I was so when I had to leave it to check my guild information! A new version in the works? 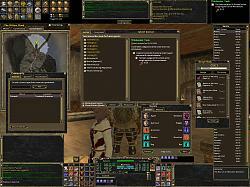 Anyone know if this UI is still being supported? I hope so because I love it! When I try to use the mail windows they are all black. 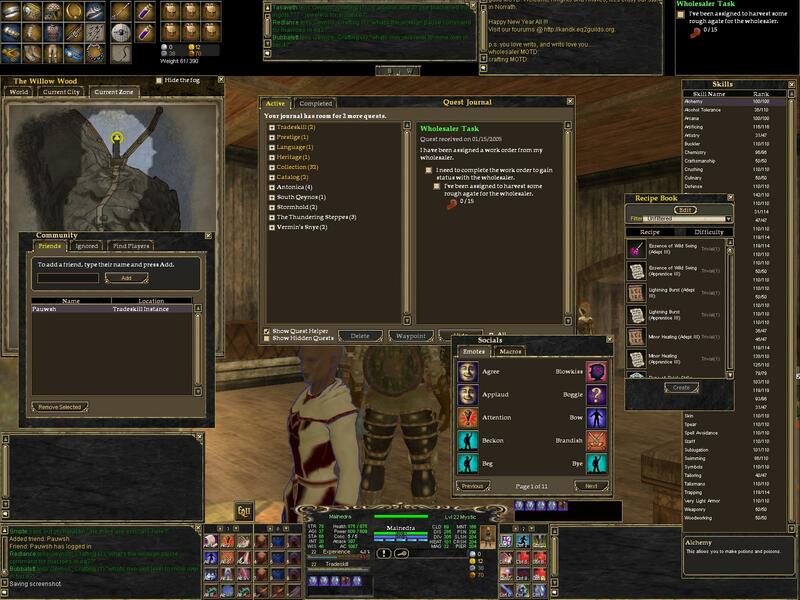 If I change eq2.ini to use default instead of Nedra they work fine. The black windows are functional in the sense that if you know where to click you can still recieve gifts, delete, etc. Just unable to see what it is you are doing. Other than that great UI.